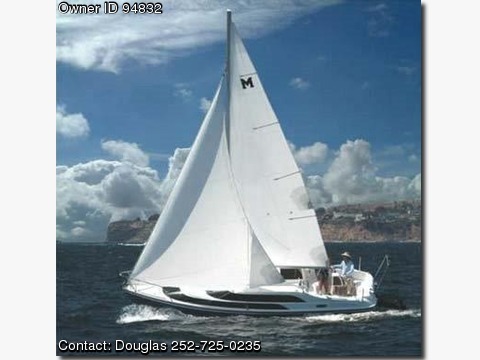 BOAT OWNER'S NOTES for 2011 MacGREGOR 26 M - CALL BOAT OWNER DOUGLAS @ 252-725-0235. OVERVIEW: THE MacGREGOR 26 IS ONE OF THE FASTEST AND BEST HANDLING OF THE TRAILERABLE CRUISING SAILBOATS, IT IS EASY TO SAIL AND EASY TO TRAILER TO YOUR FAVORITE SAILING WATERS, YOU DON'T NEED AN EXPENSIVE MOORING, IT CAN BE STORED ON ITS TRAILER, LAUNCHED AT ANY RAMP, AND RIGGED IN JUST MINUTES. FEATURES: 2012 ALUMINUM TRAILER with SURGE DISC BRAKES INCLUDED IN THIS PACKAGE, 24 MILES PER HOUR UNDER POWER WITH A 60 HP OUTBOARD, LENGTH: 25' 10", WEIGHT EMPTY 2550 LBS, GREAT SAILING PERFORMANCE, POWERING RANGE AT 16 MPH 115 MILES, MAXIMUM RANGE 283 MILES AT 6 MPH, MINIMIZE YOUR FUEL BILL - YOU CAN SAIL FOREVER FOR FREE, EASILY TRAILERED AND LAUNCHED, NO NEED FOR EXPENSIVE IN-THE-WATER STORAGE,BUILT IN SOLID FOAM FLOTATION TO KEEP THE BOAT AFLOAT IN THE EVENT OF FLOODING OR DAMAGE, LAUNCH AND RIG IN 10 MINUTES, UNDER 8’ WIDE FOR LEGAL TRAILERING, FLOATS IN 12" OF WATER, WATER BALLAST SYSTEM FOR SELF RIGHTING STABILITY, REMOVABLE WATER BALLAST 1150 LBS, PERMANENT BALLAST 300 LBS, FULL STANDING HEADROOM, FULL GALLEY, ENCLOSED HEAD, SLEEPS 6, 2 DOUBLE BERTHS AND 2 SINGLES, WHEEL STEERING, WALK THROUGH TRANSOM, ALL FIBERGLASS CONSTRUCTION, STORAGE FOR TWO 12 GALLON FUEL TANKS. DESCRIPTION: ON THE TRAILER AT HIGHWAY SPEED, YOU CAN VISIT GREAT PLACES THAT WATER BOUND BOATS WILL NEVER SEE, AND YOU CAN AVOID THE EXPENSE OF IN THE WATER STORAGE, THE MacGREGOR 26 OFFERS HIGH SPEED POWERING WITHOUT COMPROMISING SAILING PERFORMANCE, YOU CAN HAVE THE PEACE AND QUIET OF SAILING, OR THE FUN OF POWERING AROUND AT A GOOD CLIP--OVER 22MPH, UNLIKE ANY OTHER BOAT, IT OPENS UP A WORLD OF ENDLESS VARIETY--SAILING, SWIMMING, FISHING, DIVING, WATER SKIING OR JUST FOOLING AROUND ON THE WATER, ITS HIGH SPEED UNDER POWER LETS YOU GET TO CRUISING WATERS THAT ARE OUT OF REACH FOR A CONVENTIONAL 6 MPH SAILBOAT, YOU CAN LIVE ON THIS BOAT ON LAND OR ON THE WATER, LAUNCH THE BOAT, ANCHOR IN A QUIET COVE, AND YOU CAN BE AS FAR AWAY FROM THE WORLD AS YOU WANT TO BE, YOU CAN HAVE YOUR OWN ISLAND FOR FREE AT SOME OF THE MOST BEAUTIFUL VACATION AREAS ON EARTH, UNLIKE LAND BOUND RECREATION VEHICLES, YOU WILL NOT BE LIMITED TO CROWDED AND EXPENSIVE RV PARKS, YOU WILL NEVER TIRE OF THE WONDERFUL SENSATION OF SHUTTING OFF THE ENGINE AND ENJOYING THE QUIET SERENITY OF MOVING ALONG UNDER SAIL. THE PRICE IS LOW, THE TRAILER IS YOUR MOORING....AND THE WIND IS FREE. IF YOU HAVE ANY QUESTIONS ABOUT THE BOAT CALL ME... (Douglas) @ 252-725-0235.